‘Aeons ago, the Creator created both the Titans and the gods. He saw them first in his dreams and visions and, after he had created them, they lived on with him, long before the universe was born. ‘He took a deep breath and walked further into the stinking blackness ahead. A terrible coldness seeped into him as he travelled farther from the sun and light. Occasional movements in the stale air brushed against his skin, making even him jump with surprise. Darkness as thick as black fog wrapped itself around him. The walls were no more than damp dirt, the same as the ground that he could feel beneath his feet. The place was one huge catacomb filled with corners, steep grades and slopes. I'll be reading Rebecca Newton and the Sacred Flame soon and wanted to share some amazing teasers from the novel! It looks like the perfect fantasy read, and I'm loving that genre at the moment! 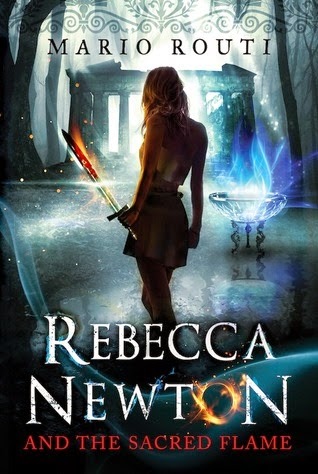 What do you think of Rebecca Newton and the Sacred Flame?